What are these little white bugs on my eggplant? I have these little white bugs on my eggplant, not many of them yet. What are they? How do i get rid of them? I'm a first year indoor organic gardener. It is important to note they are in pots. I am in the prairies of Canada. Winnipeg, Manitoba. 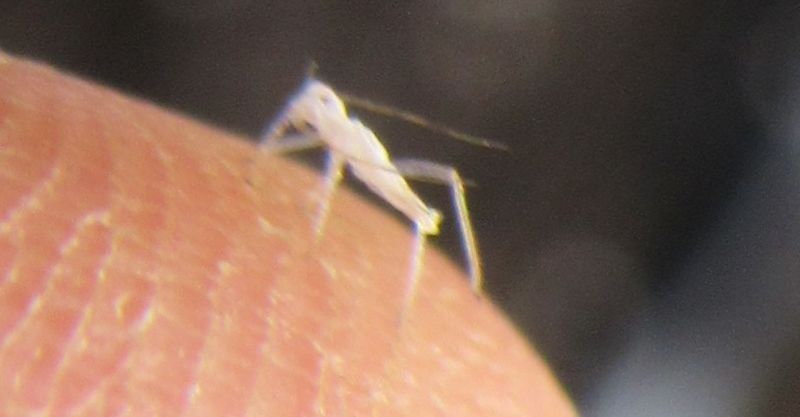 It looks a lot like an aphid cast/skin. 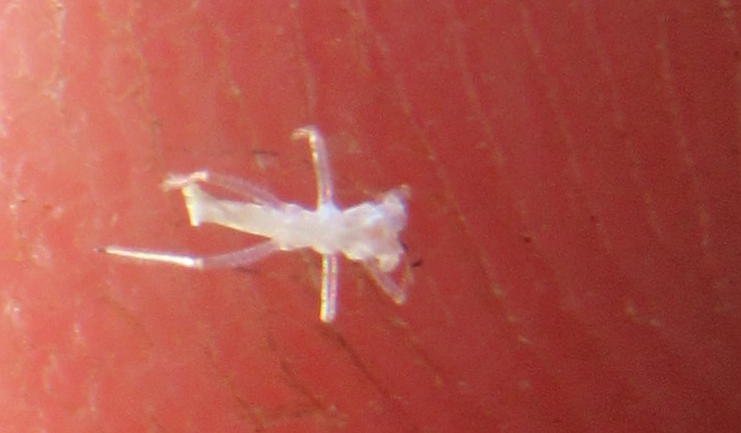 It certainly does look like a springtail. Those are great pictures, not easy to get due to their size! The springtail is very common and has been found on every continent. They live in dark, moist places, and feed on microorganisms found at the base of plants, in mulch beds, and piles of wet leaves. If the weather gets hot and dry, they frequently find their way into the house, often through drain pipes, which is why the first place we see them is in sinks or bathtubs. While hard to prevent, they can be diverted by putting dishes of warm, wet soil outside near downspouts or drains. As you've found, some will settle into houseplants, where conditions mimic their natural habitat. They can't hurt the plant, though, and pose no danger to people or pets. Management is best accomplished by picking off the ones you see, and letting your soil dry out as frequently as possible. Also, since they like to burrow, keep your soil smooth, tamped down, and free of pieces of mulch, leaves or other debris. There are pesticides available, but springtails are very hardy, and tend to be pesticide-resistant. Also, since you're growing a food crop, chemicals are a less desirable choice. You said you're an organic gardener, so I assume you're not interested in pesticides anyway! The good news is that the life cycle is generally only a few weeks, and some of those that survive will make their way outside, so they're more of a nuisance than anything else. 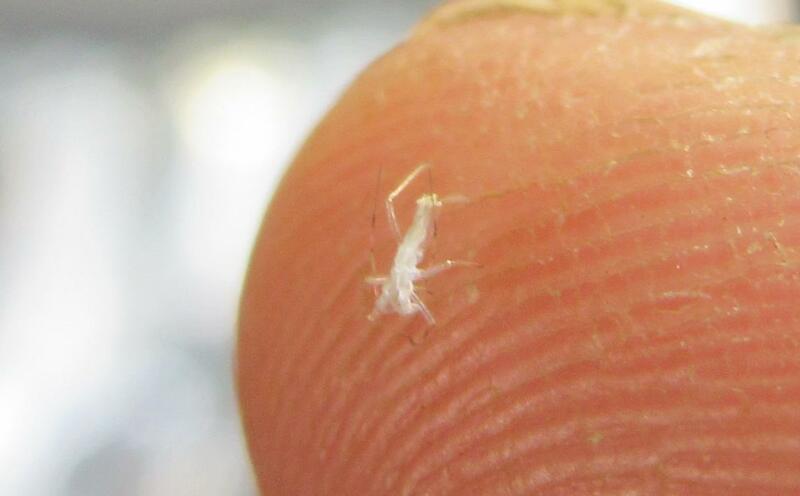 The original picture posted here is the only one on the internet I could find that looks like the bugs I found suddenly all over my tomato plants in my outside container garden. I have no idea what these are, nymph crickets kind of look like this, they are not whiteflies, or the little white bugs that look like white fuzzy rolly polly bugs called mealy bugs, as these seem to have the hinged back legs, no wings... would love to know what they arr and if they are bad for the plants. I blasted my tomato plants with my power washer and appears that got rid of them (it was dusk when I blasted them, will know tomorrow if it really worked) I live in southern Illinois near St. Louis, MO, USA. Not the answer you're looking for? Browse other questions tagged identification eggplant or ask your own question. What are these woodlouse-like bugs and how do I kill them? How do I tell when an eggplant is ready to be picked? What is this grub-like bug that's eating my eggplant leaves? What are these small yellow bugs that are attacking my eggplant, and how can I stop them? Are these spider mites on my indoor eggplant? Should I remove the tiny, cute, white and red bugs from my Umbrella plant (Variegated Schefflera)? What are these very small red bugs on my black walnut tree?